Come join us! No matter what our situation or season in life, we all need discipleship, fellowship, encouragement and opportunities to serve. 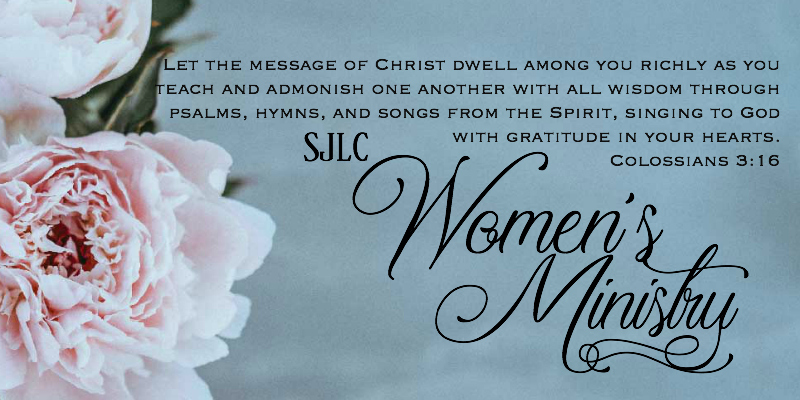 St. John’s Women’s Ministry has many options in all of those areas, and we are always open to new ideas! Women’s Bible Study: Thursday afternoon from 1:00 PM-2:30 PM in the Sanctuary. Please join us as we seek to grow with God’s Word and encouraging each other. Current study begins January 17, 2019. We will be studying the book of James with the Nav Press Study Guide. Focused On Him Quilters: This fellowship group meets once a month to create beautiful quilts. Contact Lois Johnson for times and location. Spring house cleaning and cleaning closets? Please consider taking gently used items to this volunteer operated center. They provide, free of charge, to needy residents of Napa County clothing and bedding. Residents are referred by the county, may visit the center every 60 days and can select two grocery bags of donated goods each time. Urgently needed – men’s and children’s clothing. The center is open Monday through Friday, 9 a.m. to noon at 2473 Second St., Napa.